Many of our previous family cycling outings have shown the importance of communication. Communication before you goRide – setting the expectations, making sure they understand what they need to keep themselves safe, outlining any rules, any details about the journey that you want the riders to know. There will be things you miss/didn’t expect/outside your control, so you will also need to communicate with your riders while out riding. 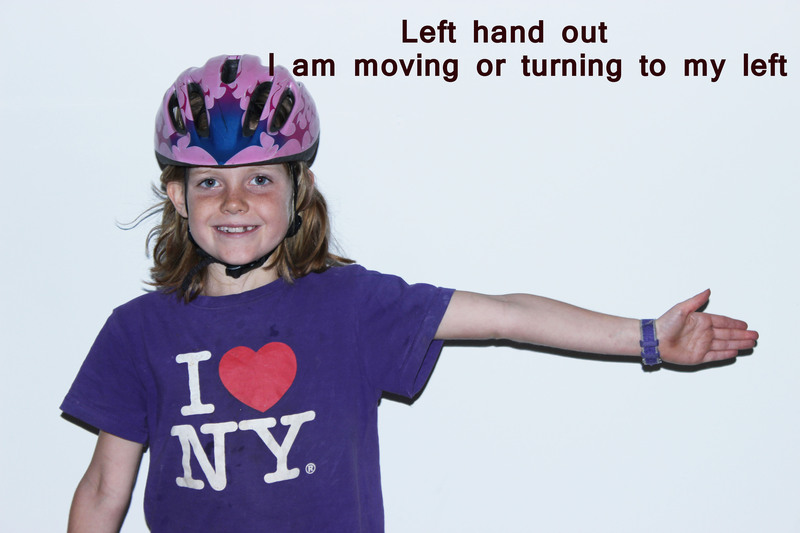 Communication while riding – You will need to give some instructions while on the bike. There will be times on the ride where you may need to re-group and discuss any issues. Sometimes if it does not pose a major safety issue, let it go while on the bike and take the opportunity to discuss it during the next stop. If you are anything like our family there will plenty of those. Every rider also needs to be able to communicate with other users of the trail or road; most commonly other cyclists, pedestrians and motorists. We can communicate with our hands, a bell (if you have one) as well as our voices. It is not always possible for the people you need to communicate with, to hear you, so that is when your hand signals become really useful. Here are some important hand signals to know. Now the goRide families are preparing for an adventurous ride. We are going to ride a part of The Great Taste Trail over 4 days and 3 nights! Yes biking and camping two great outdoor activities mixed together and commonly known as bike touring. Hollie is 7yrs old and has been riding since she was about 4yrs old. 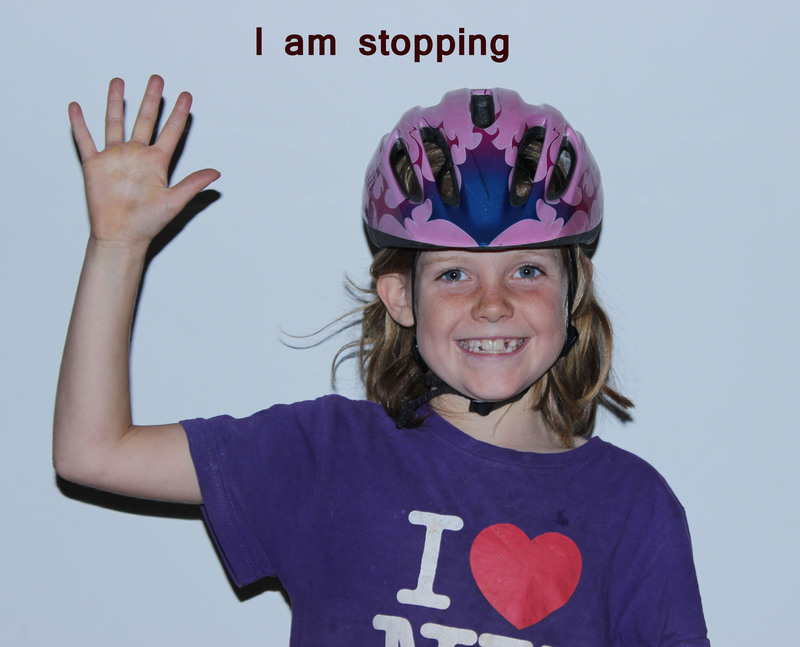 (Hollie’s story) She is the youngest girl in the group and will be riding assisted for the tour. She is going to be on a trailer bike behind her Dad. Though Hollie is a capable rider to help build her confidence and endurance Hollie has chosen to do this tour on the trailer bike. Her responsibility for this trip is to check that everyone understands the rules of the trail. The Great Taste Trail is predominantly a cycle trail, though there are many places along the trail where you are required to cross a road, maybe cycle on the road to get to and from the trail, or as you detour from the trail into villages and the ice cream shop. 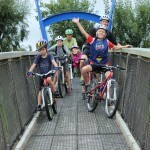 We have identified that to “get safe” for the goRide family adventure ride the kids (and the adults) need to know and understand some road safety , shared pathway rules and etiquette, able to identify potential hazards as well as some group rules. These same safety prinicples would apply for most family cycle rides whether you a cycling for half an hour, a day or multiple days. 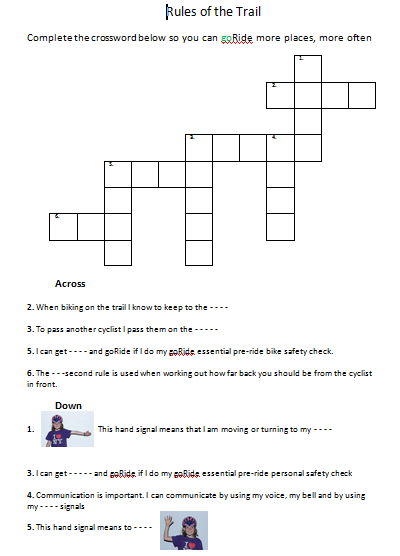 To follow is the story of how we “got safe” by learning the rules of the trail for our trip and a crossword (that Hollie helped put together) for the group to complete to check everyone understood how to keep themselves and our group safe while riding. Stop at any road crossing, check traffic (look right, left and right again). Do not let children cross until they have checked with an adult. We encourage that the children make the decision to cross but that decision needs to OKed by an adult. You need to travel at a safe distance behind the cyclist in front in case they stop suddenly or change direction. Use the 2 second rule. To check you are 2 seconds behind watch the cyclist in front pass something on the road or trail and count the seconds until you pass the same object. If you can count to 2 or more then you are traveling at a safe distance behind. For further information on road safety please refer to The New Zealand Transport Agency online resource The official New Zealand code for cyclists .This resource is also available in a booklet form. Bicycle Bells are great for track safety. On a shared pathway you need to ride on your left. It is OK to ride more than one abreast (so side by side) if the trail or pathway is wide enough as long as when you see a cyclist or pedestrian coming in the opposite direction you make your way back to the left of the pathway. 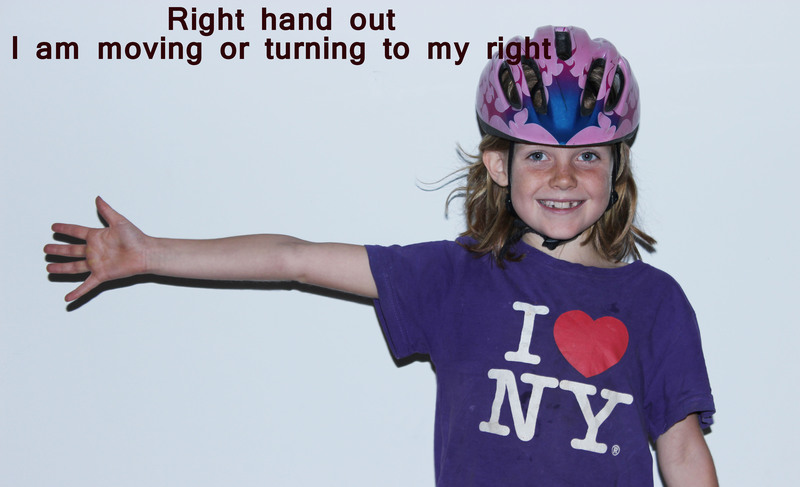 You only overtake another cyclist on the right hand side. When passing pedestrians it is courteous to slow down, consider the capability of the pedestrian to determine how you go pass them. The 2 second rule also applies between bikes on the trail. You know and understand the personalities and characteristics of the members of your group, so there may be some rules/guidelines that you would like to make sure are communicated and understood before you goRide with your group. Here are the rules that we decided as a group were important for our ride. It is not a race. There is a long way to ride everyday. It is important to travel at a pace that you know will get you to the end. It is a big adventure for everyone and we are a team doing this adventure together so we need to support each other and work together. There may be times when you are feeling a little tired and low and the group will support you and likewise there will be times when others are feeling low and tired and it is important that you support and encourage them. There will be plenty of time for everyone to have a go leading while we ride, if this is important to you, if you would like a turn being a leader at anytime then let one of the adults know and we will work with you to allow you to spend some time leading the group. Though the crossword is quite simple and some of your older children may find it quite easy it is great to know that everyone understands some basic rules before you set off. You will know that you have communicated well before you goRide and it will make for a calmer more relaxed adventure. I know my rules of the trail. Let’s goRide more places more often. Let’s goRide The Great Taste Trail. goRide is a shared journey, so we would like you to assist in guiding it along the way. Contact goRide. Your thoughts, comments or feedback are welcome. Thank you for being a part of the goRide way.